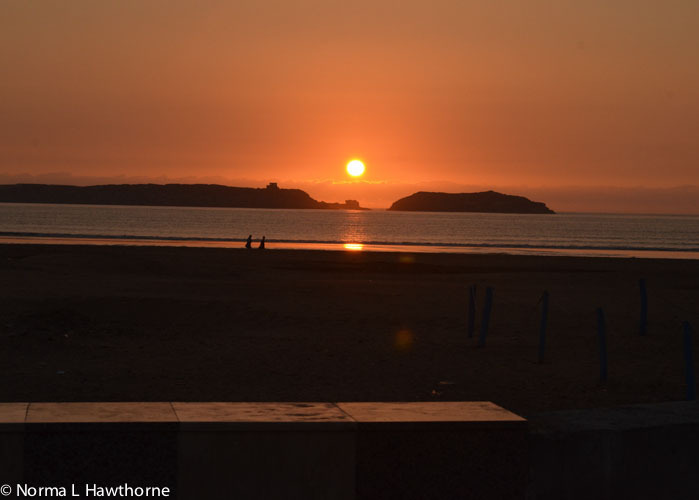 Last night at sunset I met friends at Beach & Friends Cafe, the last set of buildings on the Essaouira strand before leaving town and heading south toward Agadir. It is where you can get a great seafood dinner with a good glass of vin ordinaire — red table wine — for a reasonable price. The ocean view and camel entertainment can’t be beat. 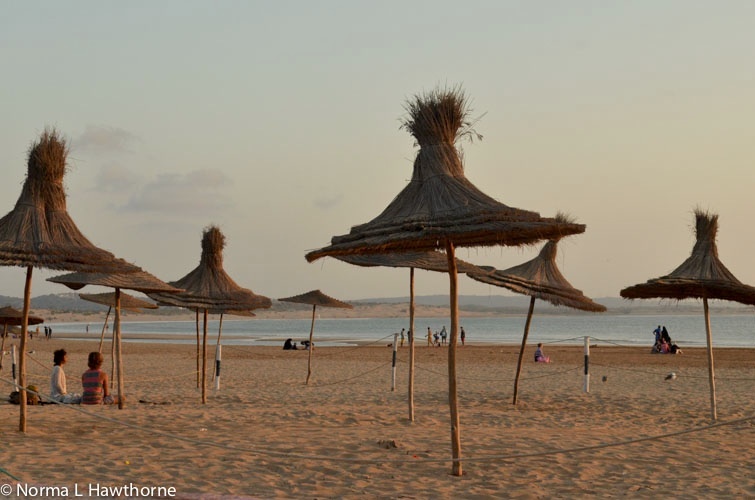 It takes a brisk half hour walk from the Medina along the crescent shoreline to get there. 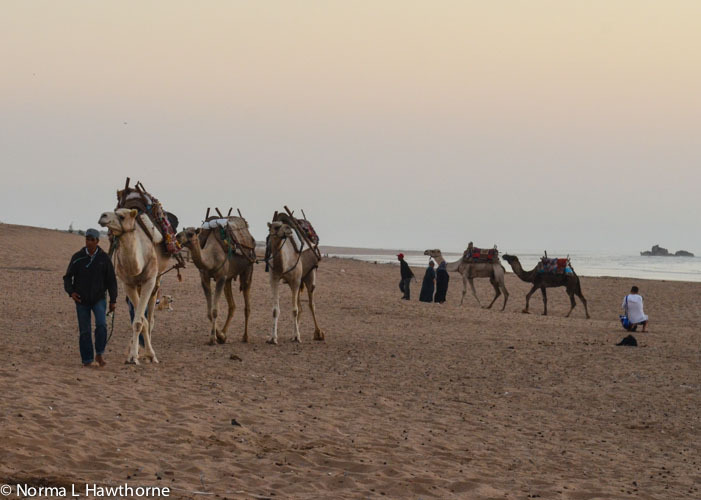 In the distance I could see the sand dunes rising and the outline of camels and horses. I passed families strolling and tourists catching the last rays for the perfect tan. Camels! I have ridden elephants in Thailand but never camels. 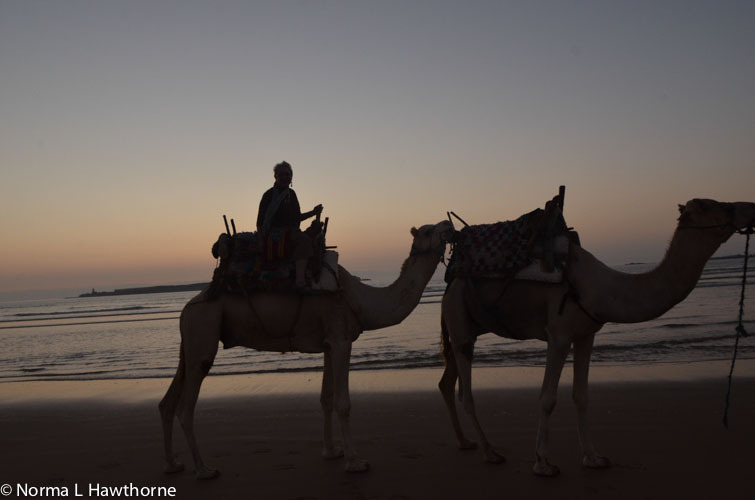 A camel ride at sunset in Essaouira? Why not! The view is nothing short of spectacular. 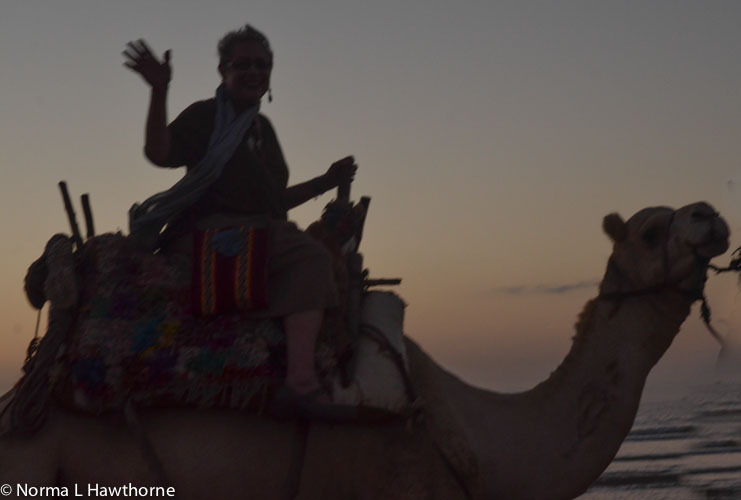 It is not easy to get on top of a camel, even when they are sitting. That hump is very big. When I got situated on top of the Boucherouit rug that covered her back, I was pretty high up and the camel hadn’t even risen yet. I was thinking, how will this animal get up without me falling off. Hang on, the two young camel herders said in French as they motioned for me to grab both wood poles attached to the saddle. 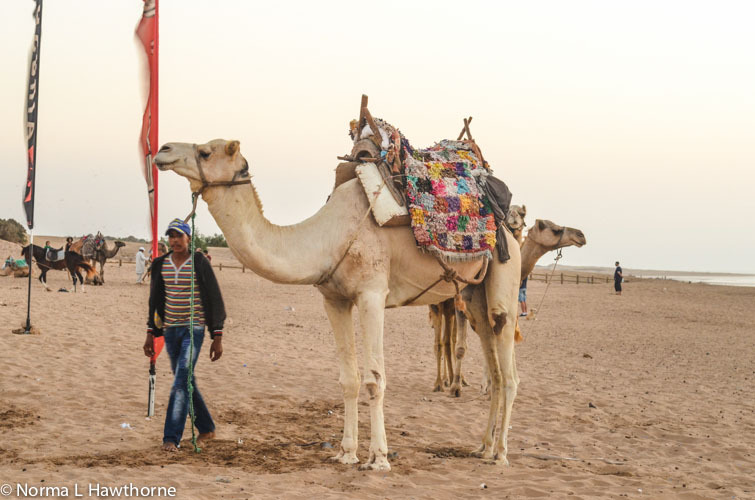 With my camera and money bag dangling, the camel slowly rose and I swayed like I was on a small boat in rough seas. As the camel made its way across the dunes, I looked out and imagined what Lawrence of Arabia must have felt like. Then, someone told me he rode a motorcycle across the desert. Most of the photos were blurry. 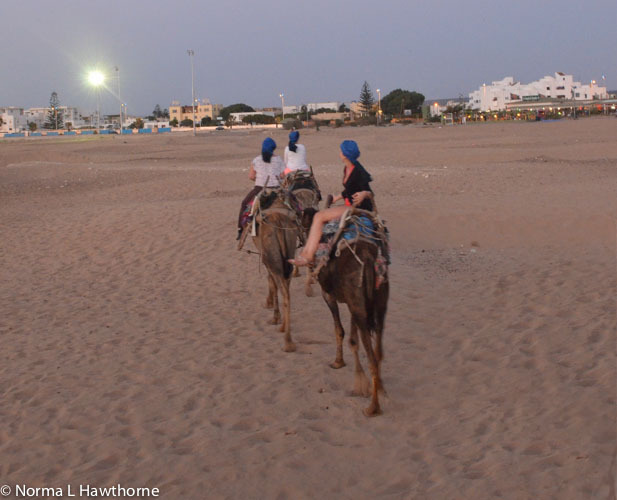 Have you ever taken a picture from the back of a camel? Hah! I surrendered my camera to the herder who assured me he would get great photos for an extra 100 dirham as he pointed the lens into the sunset and stepped back into the surf. Do you recognize me? These three women in a camel train ahead of me were on their way back to the cafe, too. I managed to get one in focus, sort of. And, I loved the experience! Scary. Thrilling. Definitely fun. 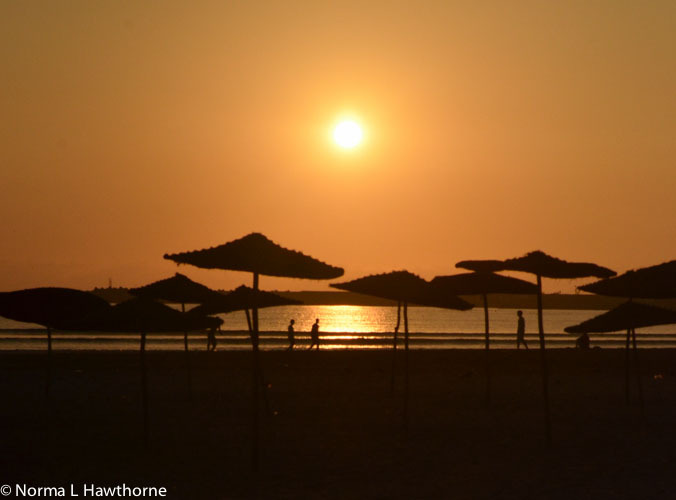 This entry was posted in Photography, Travel & Tourism and tagged beach, camels, Essaouira, Morocco, sunset. Bookmark the permalink. Elena, Morocco is similar to Mexico. Mountains, desert, great food, enjoyable people, artistic, ethnic, diverse, and affordable. It is easy to be here. Yes, Brigitte and Ivan plan to return to France. Sad. Very sad. And, an excuse to go to Brittany when they settle there. They are very talented and dear friends. Am laughing out loud, as I remember exactly that same experience when I rode a camel in Petra. Bravo! I’m ready to ride another camel, Linda. I’m thinking that maybe the next time I will have better balance and I won’t be as skittish 🙂 Four more days here, so other opportunities to try and try again! Glad the story brought you a giggle.